I brought back a new ingredient when I went back to Singapore recently – salted egg yolks in powder form! Salted egg is a preserved food product made by soaking duck eggs in brine or packing them in damp, salted charcoal. The resulting egg will have a white that is salty and a yolk that is rich, fatty and slightly less salty. 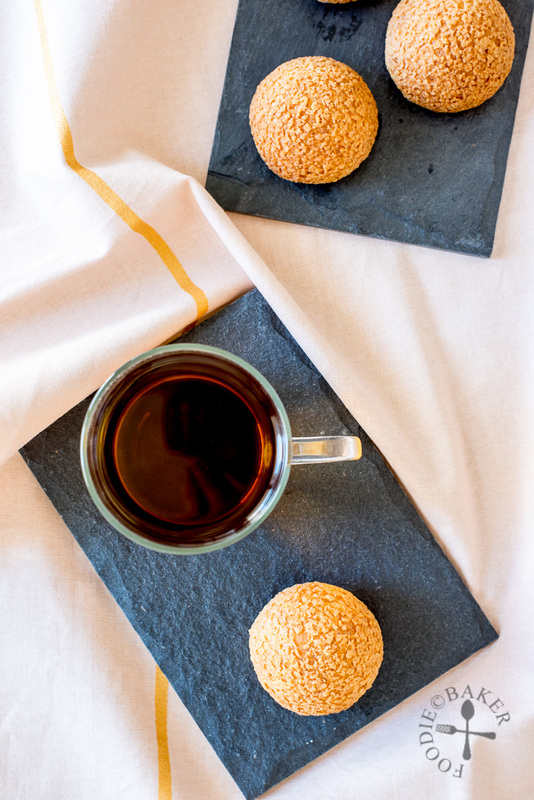 The entire egg is usually hard-boiled and served with congee, but many people – including me – has a special love for the yolk because it is a lot more delicious – the yolk can be steamed and use whole in Chinese mooncakes, or mashed and combined with other ingredients like butter, cream and/or milk to create a custard to fill in buns or a sauce that is incredibly yummy over fries, seafood, fried food etc. As much as I love salted egg yolks, I seldom buy them because usually a salted egg yolk sauce recipe will require 3 or 4 egg yolks and it’s a pain to find ways to use up the leftover egg whites. Hence imagine my delight when I found this new product at the supermarket! It’s a little bit pricey, but I love the convenience (especially since we are living overseas). So the first thing I made with the salted egg yolk powder are these Salted Egg Yolk Cream Puffs! The Salted Egg Yolk Cream Puffs consist of 3 components – the croustillant, the choux and the salted egg yolk pastry cream. 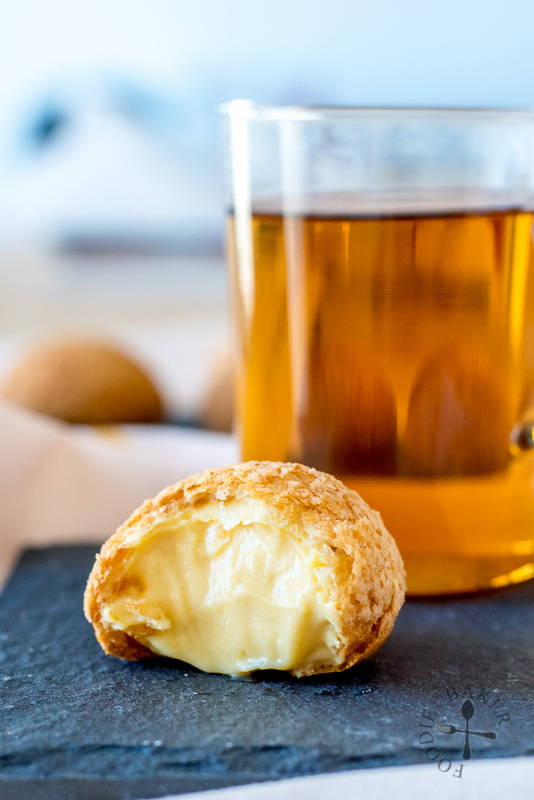 Croustillant means “crisp” in French, and in cream puffs (aka choux), it is the crunchy topping on top. 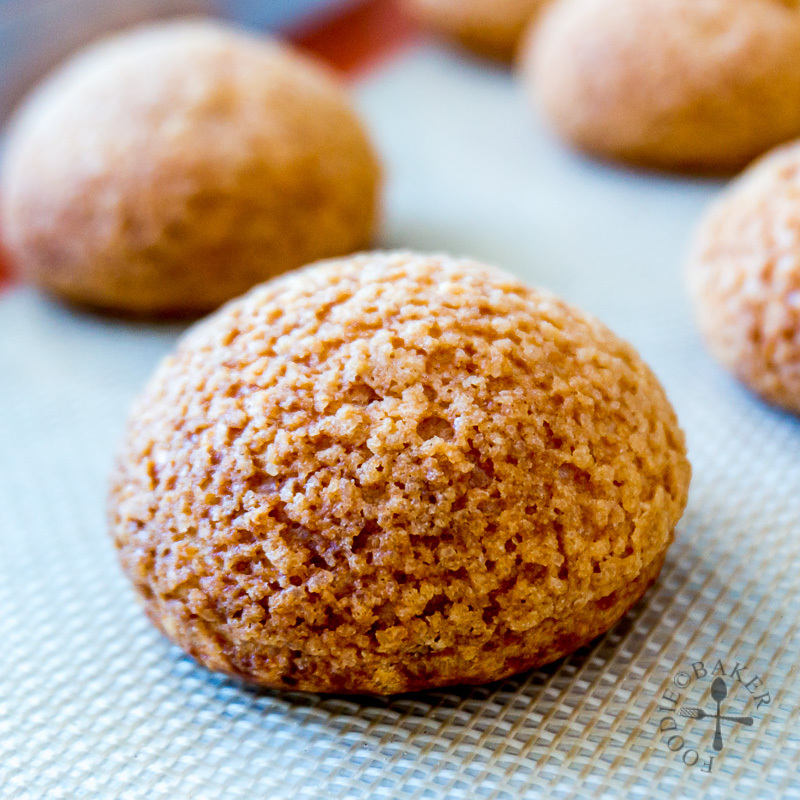 Besides providing the cream puffs with a crunch and makes them look pretty, croustillant also helps the choux to puff up nice and round without cracking. I use the same choux recipe that I’ve been using since a long time ago. I piped small mounds of 3.5-cm diameter as I don’t want the overall puff to feel too rich and heavy. 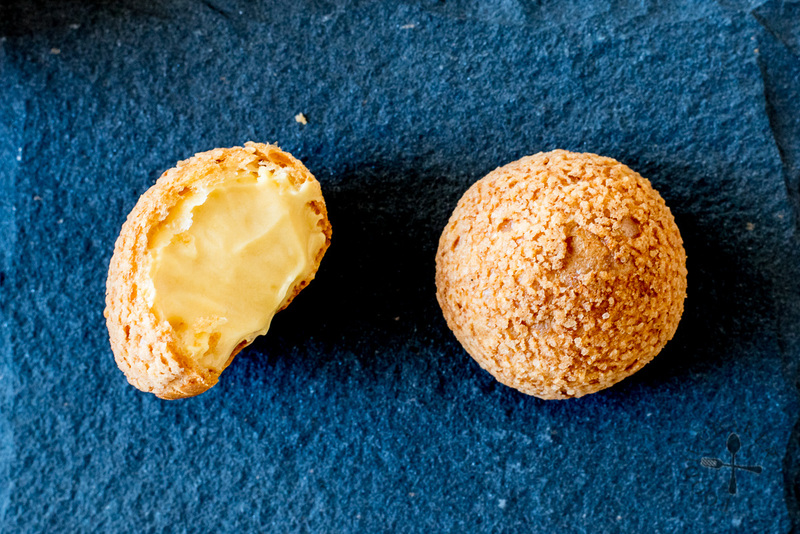 The croustillant are cut into 3.5-cm rounds and placed on top before baking – it is important they are the same size so that the croustillant covers the top of the choux completely. 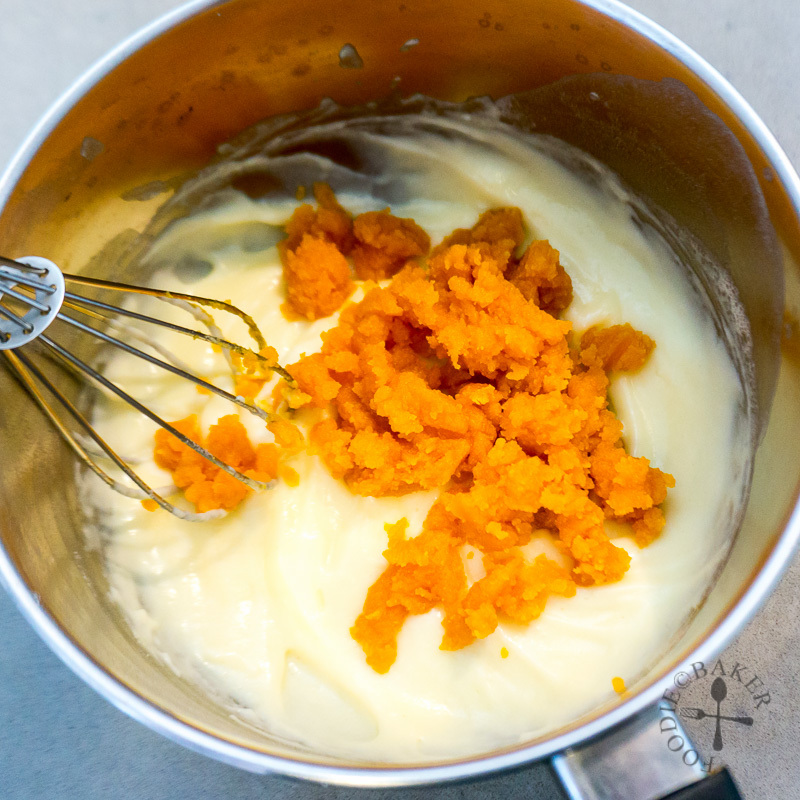 I got the idea on how to make the salted egg yolk pastry cream for Sumopocky – by incorporating a salted egg yolk paste (made with milk, butter and salted egg yolk powder) into a plain pastry cream. I used quite a lot of salted egg yolk powder for the flavour but as the powder is not as salty as from those regular salted eggs, the resulting pastry cream is not overly salty. The Salted Egg Yolk Cream Puffs are very interesting because we have never had a cream puff with a savoury filling. Unfortunately X was not a fan of them because he doesn’t like his desserts savoury, but my friend and her husband enjoyed this new choux flavour. As for me, I like them in moderation – they have a unique and interesting flavour but because I’m a boring person, I still prefer cream puffs filled with vanilla pastry cream to these Salted Egg Yolk Cream Puffs. Nevertheless, I think these Salted Egg Yolk Cream Puffs will be a special and one-of-a-kind dessert as your guests will never expect to be biting into a savoury filling! If you love everything salted egg yolk, give these cream puffs a try! Here are the step-by-step photos for the croustillant, the choux and the pastry cream – recipe is at the end of the post! 2) Roll it out between two sheets of silpat until 3-mm thick. Freeze until firm and cut 3.5-cm rounds with a cutter. Keep them frozen until required. 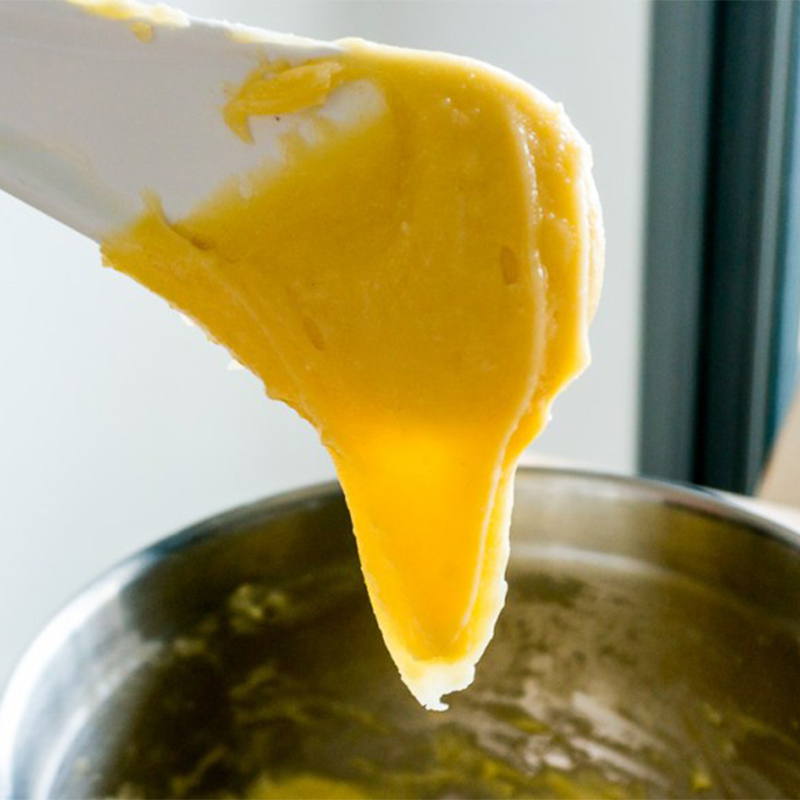 2) Remove from heat and whisk in the salted egg yolk powder until a thick paste is formed. 2) Whisk in the flour. 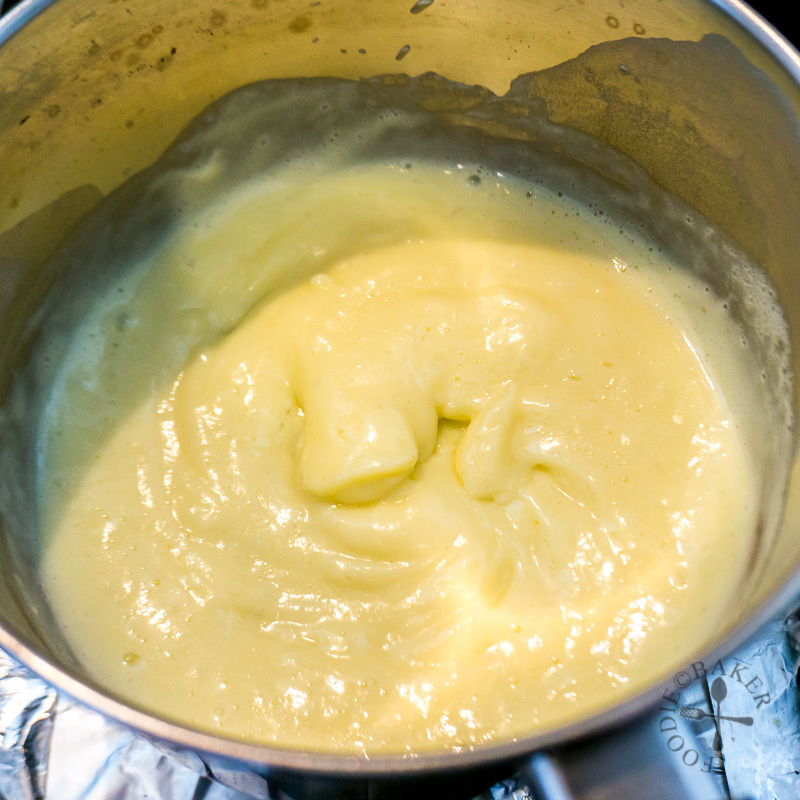 4) Return mixture to a pot and cook, whisking constantly, until the pastry cream thickens and come to a boil. 6) Transfer to a clean bowl, cover with clingfilm or parchment and chill completely in the refrigerator. 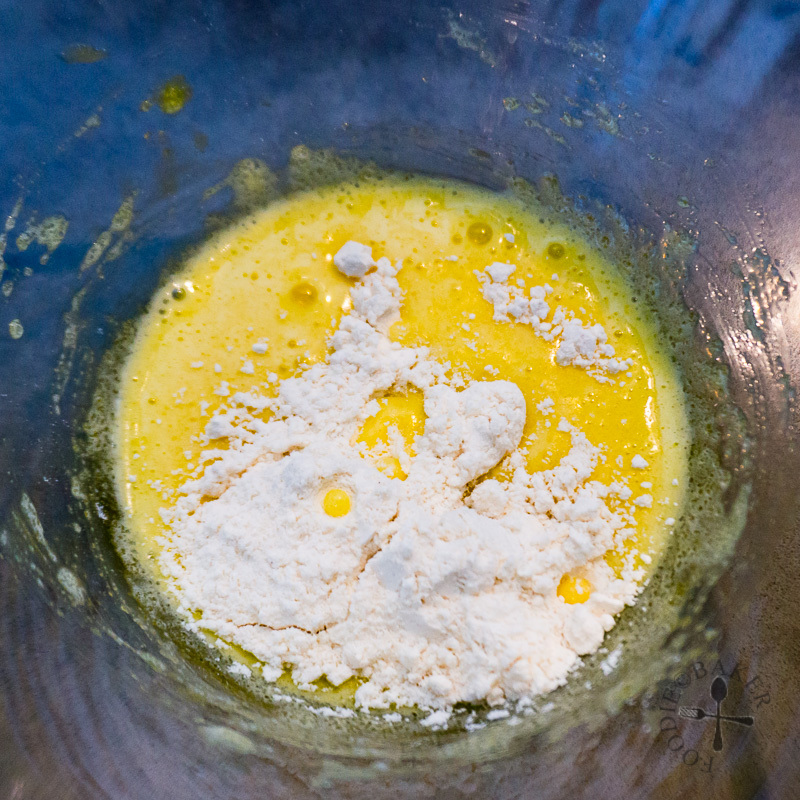 2) Add the flour in all at one go and stir quickly and vigorously to mix in all the flour to form a dough. Cook the dough until a thin film of dough forms at the bottom of the pot. Remove from heat and let cool slightly. 6) Place 1 croustillant round on top of each choux, pressing it down slightly. 1) Whip the cream into semi-stiff peaks and fold into the pastry cream. 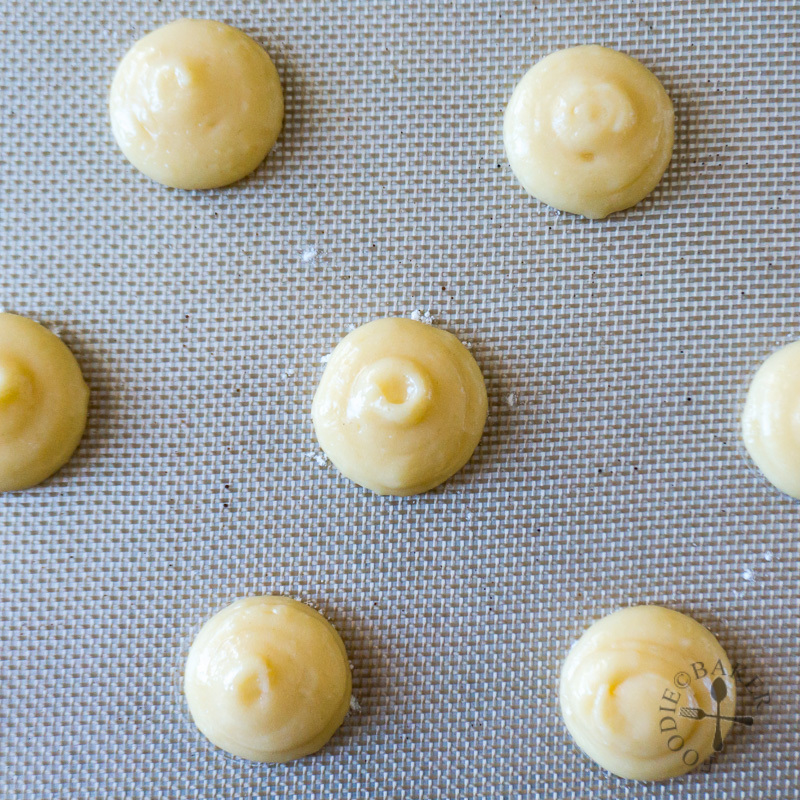 Transfer pastry cream into a piping bag and piped into the cooled choux. Combine softened butter, sugar and flour together in a mixing bowl with a wooden spoon or stiff spatula until a soft dough is formed. Roll out the dough with a rolling pin between two sheets of silpat or parchment paper until the dough is very thin, about 3-mm thick. (Note that you may need to divide the dough into 2 portions if your silpat is half sheet pan size 46x33-cm). Freeze the croustillant (together with both silpat / parchment paper) for 30 minutes until firm. 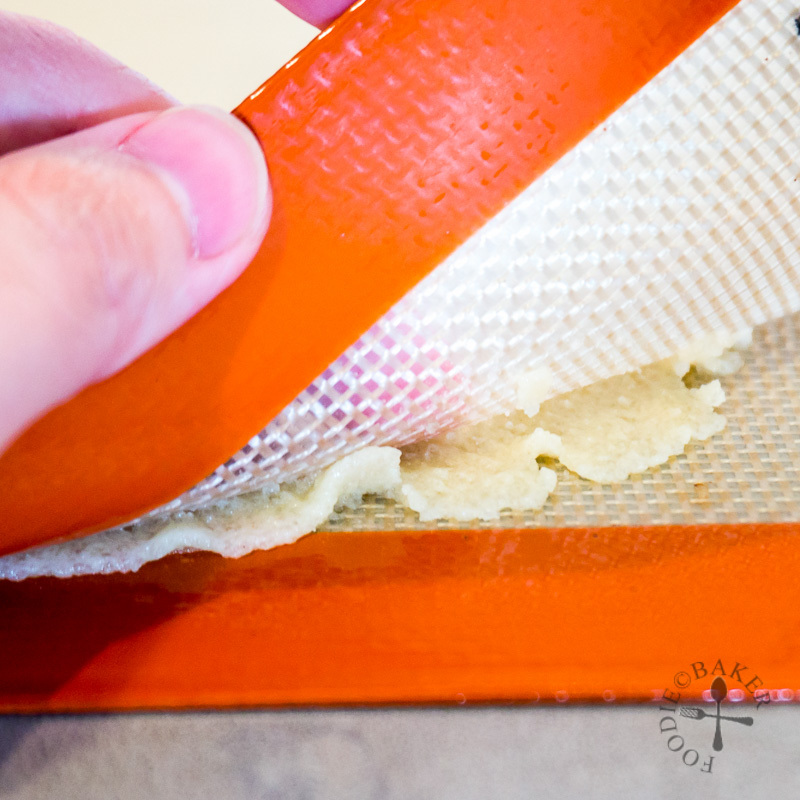 Peel off the top layer of the silpat / parchment paper and use a 3.5-cm round cutter to cut as many rounds as possible. Return the croustillant to the freezer until needed. 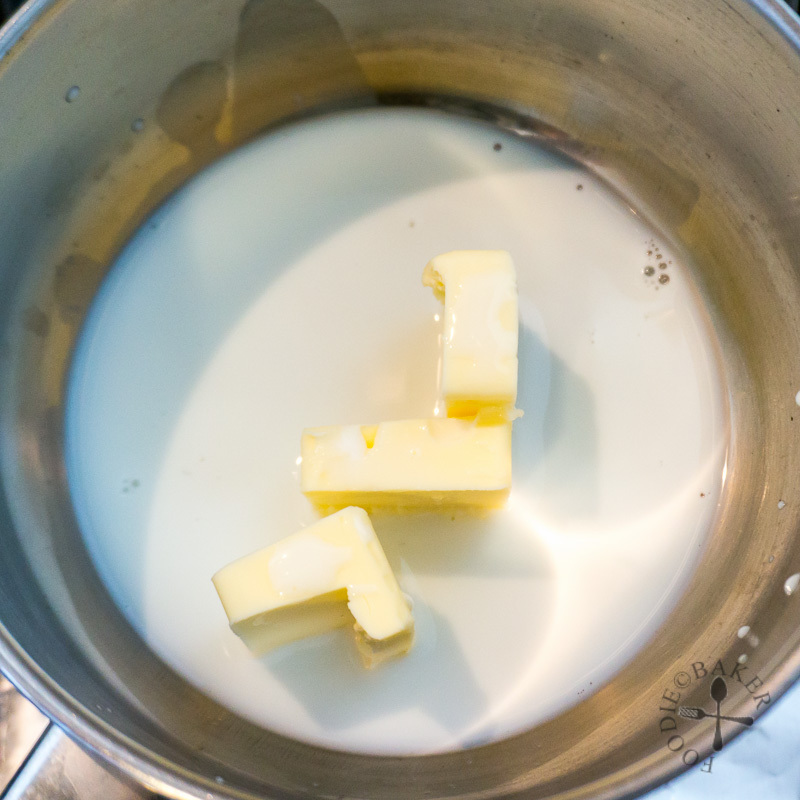 Place milk and butter in a small pot. Cook over low heat, stirring frequently with a spatula, until the butter has melted. Turn up the heat and bring the mixture to a boil. 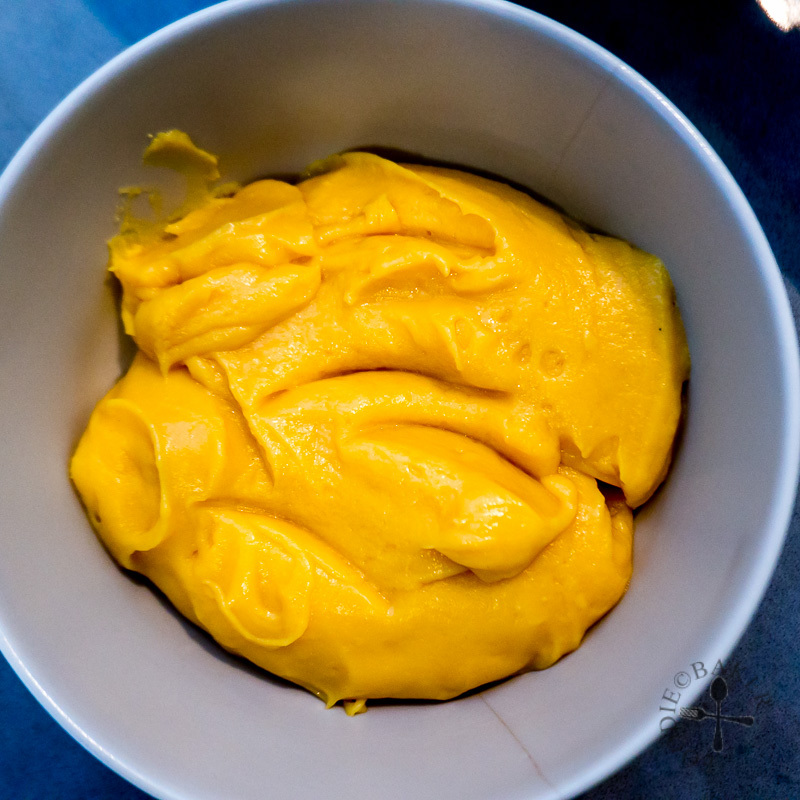 Remove from heat and use a wire whisk to whisk in the salted egg yolk powder until a thick paste is formed. Set aside. 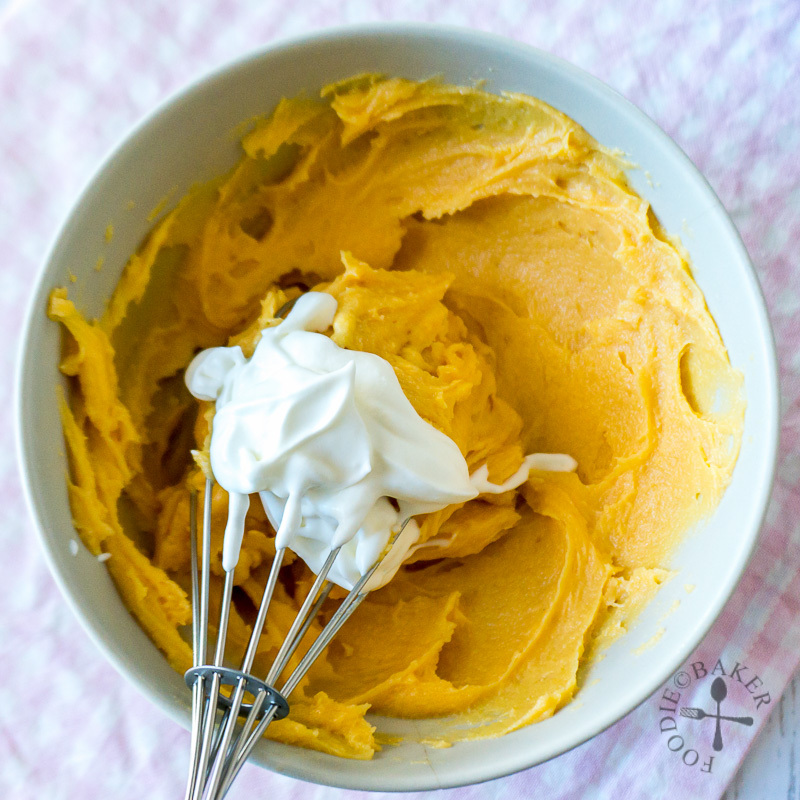 Whisk egg yolks and sugar with a wire whisk in a small bowl. Whisk in the flour. Set aside. Heat milk and salt in a pot over high heat until it starts to simmer. 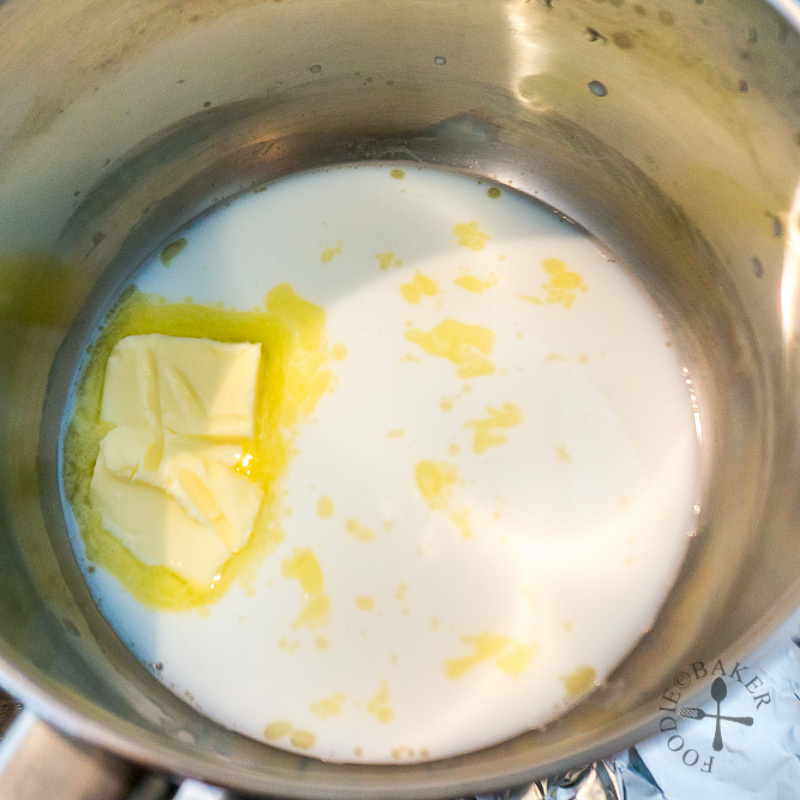 Pour the hot milk in a thin stream into the egg-yolk mixture while whisking continuously until all the hot milk is added, making sure to scrape the bottom of the bowl to mix everything thoroughly. 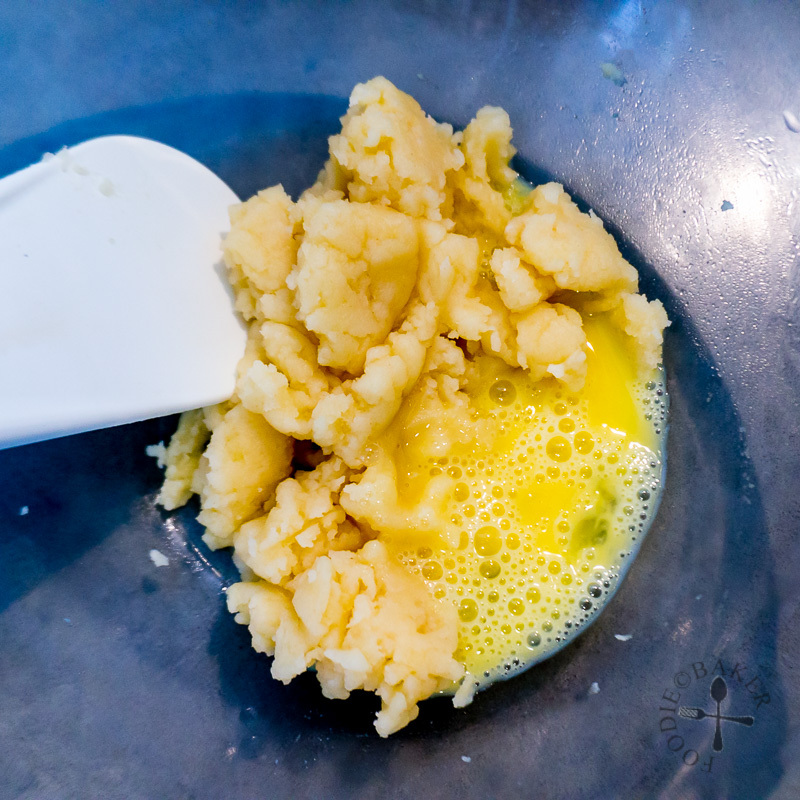 Remove the pot from heat and whisk in the Salted Egg Yolk Paste. Scrape the mixture into a clean, dry bowl (the larger the better, so it cools down faster.) If there are lumps, strain the pastry cream through a sieve. Press a piece of parchment paper or plastic wrap onto the surface of the pastry cream and chill completely in the refrigerator, about 1 hour. Preheat oven to 180C / 355F. Line baking sheets with parchment paper or silpat. Dip the 3.5-cm round cutter (the one used to cut the croustillant) into flour and make markings on the baking sheet. Have all the ingredients measured and ready. 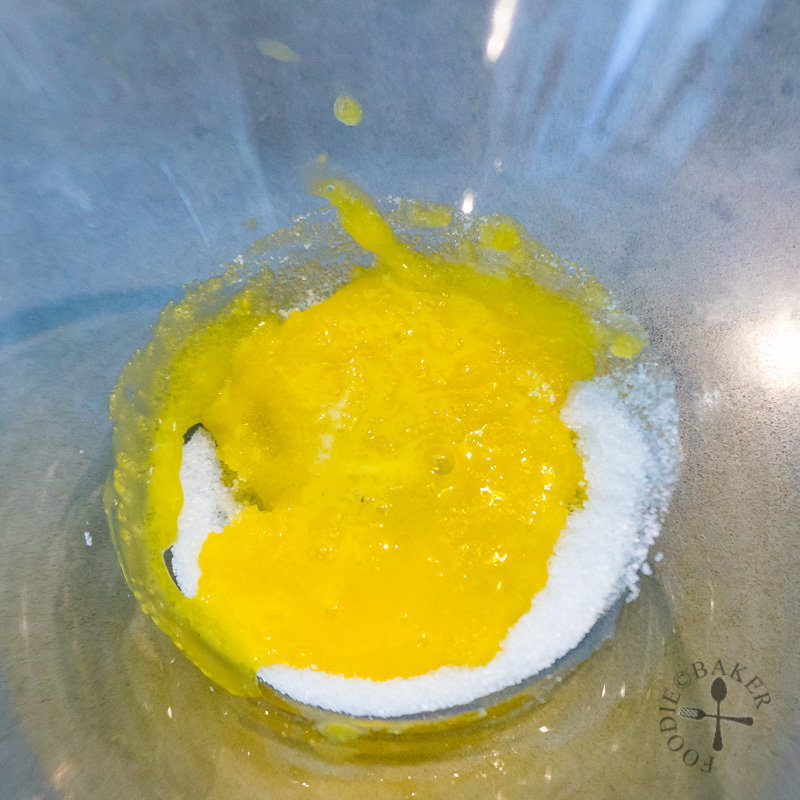 Transfer the choux into a piping bag fitted with a round tip (maximum 1.5-cm big). Pipe 3.5-cm mounds of choux onto the baking sheet. 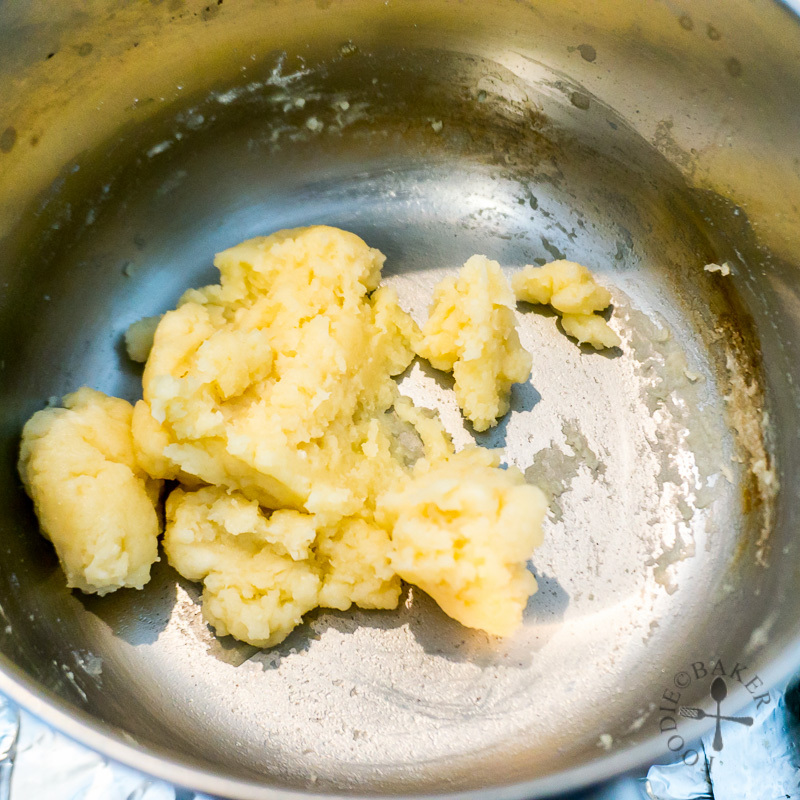 Remove the frozen croustillant from the freezer and working quickly, use an offset spatula to loosen the croustillant rounds and place one on each piped choux, pressing it down slightly. Bake at 180C / 355F for 20 minutes, until the dough is well-risen - do not open the oven door at all during this period to check on the choux. Reduce the heat down to 150C / 300F, open the oven door to release the steam and close the oven door. Bake for another 20 minutes until the choux is dry, crisp and golden brown. Remove the choux from the oven. 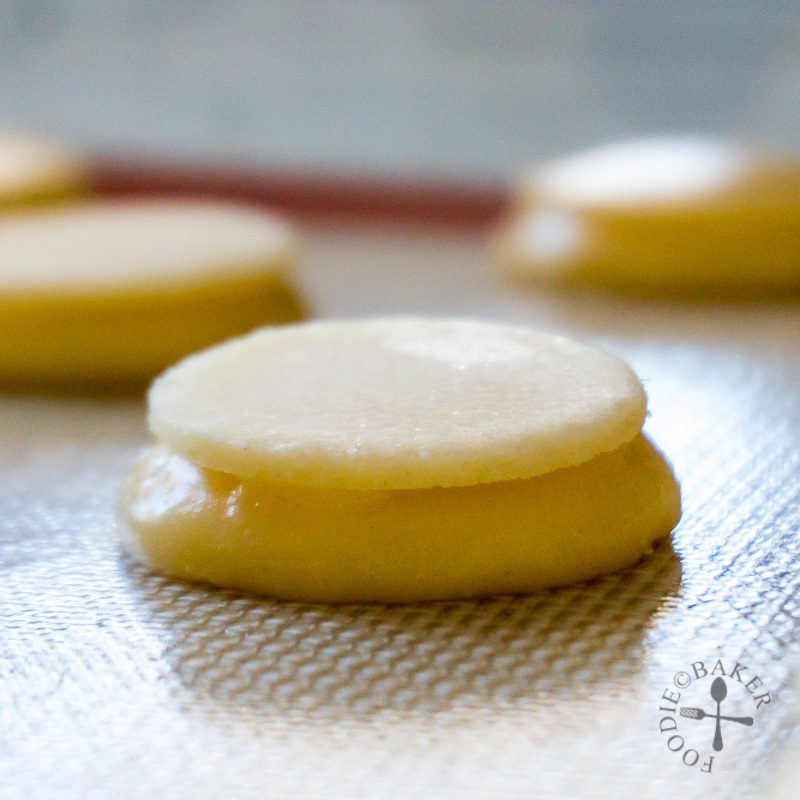 Turn the choux over and use a piping tip to poke holes to release excess steam. Transfer to a wire rack and let cool completely before filling with pastry cream. Remove the pastry cream from the refrigerator - it will be quite firm at this point so use a wire whisk and whisk gently to make it smooth. 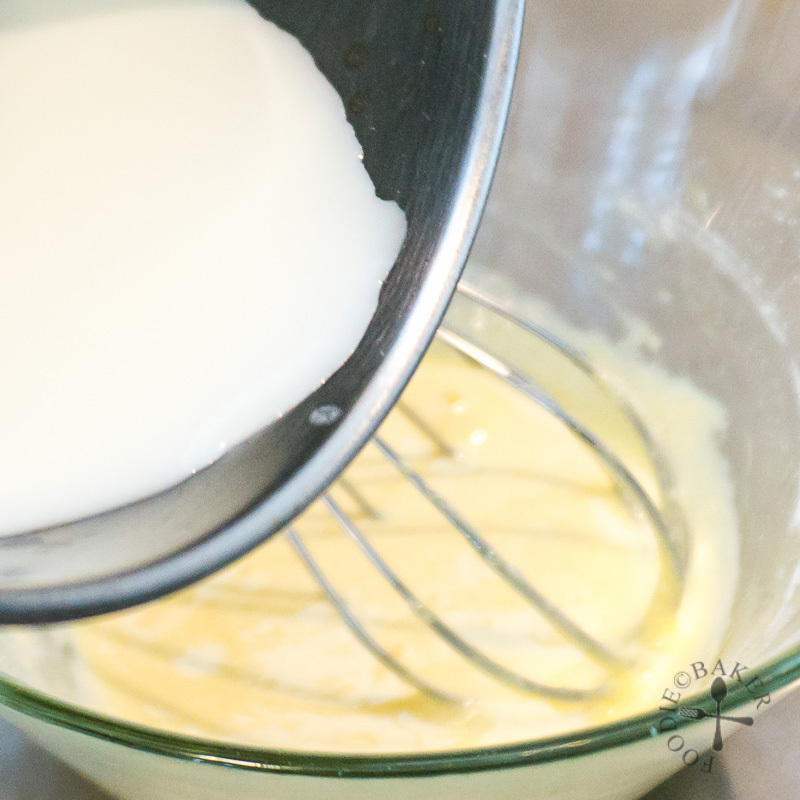 Don't whisk too much as the pastry cream will become watery. Gently fold in the whipped cream. Transfer the pastry cream into a piping bag and fill the choux with pastry cream. 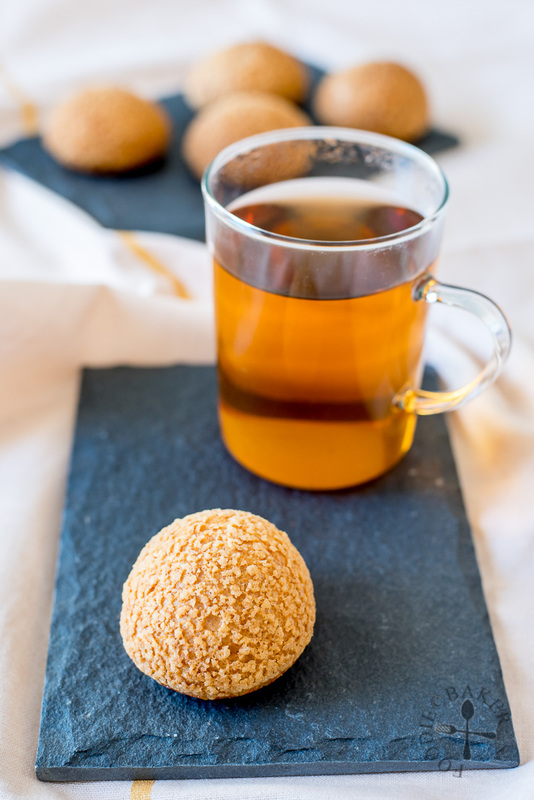 - To ensure the croustillant stays crunchy, the cream puffs are best eaten as soon as possible after they are filled, so try to fill them only at the last minute. Both the choux and salted egg yolk pastry cream (without the whipped cream) can be made a day ahead. 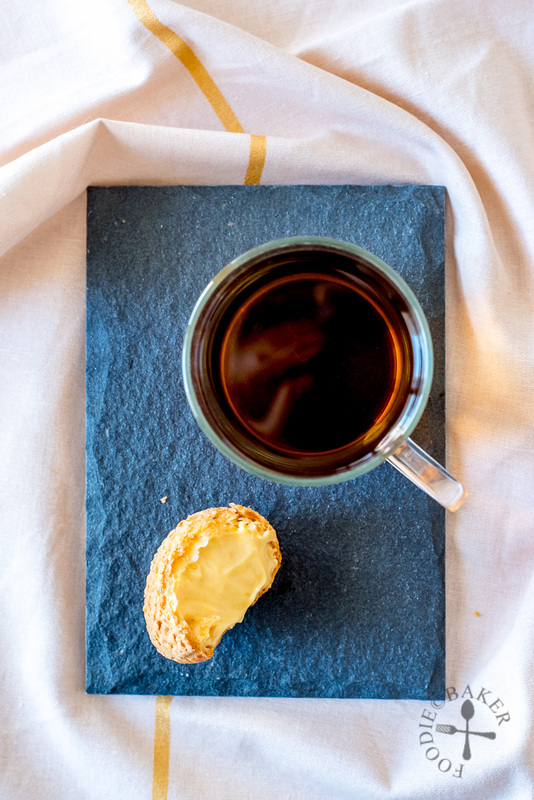 Store the choux in an airtight container at room temperature and the pastry cream in the refrigerator. If the choux is soft the next day, they can be re-crisped in a 175C / 350F oven for 5 to 10 minutes. Fold in the whipped cream into the pastry cream just before filling. Excuse me, I’m from Vietnam and it’s difficult to find salted egg yolk powder here. So how many salted egg yolks do I need to replace the amount of powder in your recipe ? Thanks a lot. Hello! I haven’t tried the recipe with salted egg yolks but I reckon you will need about 4 to 6 salted egg yolks. Salted egg yolk powder is less salty so you may want to experiment with 4 salted egg yolks first and increase from there and omit the salt in the pastry cream. Hello! I haven’t tried this recipe with salted egg yolks but I reckon about 4 to 6 salted egg yolks. Salted egg yolk powder is not as salty so I suggest omitting the salt in the pastry cream and experiment with 4 salted egg yolks first. Happy baking! This is certainly something I would love to try, sweet and salty do pair well. They do look stunning as well! I’m with you and love finding new convenience products like this to make our fave recipes. I’ve never had salted egg yolk cream puffs, but I’d sure love to sample one of these.